Will the lure of tech earnings keep the markets positive for a fifth consecutive week? Since earnings are only averaging about 14% growth for Q4 and down from the 22% in Q3, the expectations have faded. However, compared to sentiment four weeks ago we are significantly improved. The challenge will be to navigate the mine field of earnings beats without owning the stock that finally blows your foot off with a disappointment. Fortunately, some of the stocks that have posted disappointments have not imploded. The $14 decline in Netflix is just a hiccup compared to the 50% gain since Christmas. Netflix is a cult stock. We are probably not going to be so lucky with other stocks as the earnings cycle continues. Working in our favor was the extremely oversold conditions on the Christmas lows. However, after four weeks of gains we have reversed to the overbought side of the ledger. Just like markets can remain oversold for longer than we expect they can also remain over bought for longer than we expect. Hopefully that is the case this week. The overbought pressures are rising as we can see in the AAII sentiment report for the week. 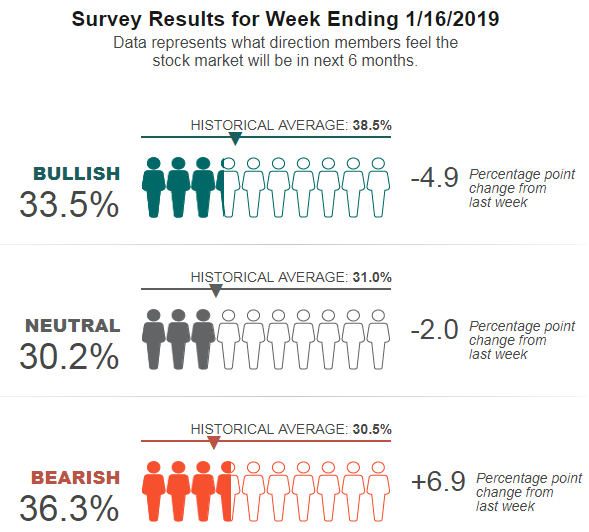 Despite a 700-point gain in the Dow the bullish sentiment declined -4.9% and bearish sentiment rose almost 7%. This survey does close on Wednesday so the $1 trillion offer from China was not yet in the market. 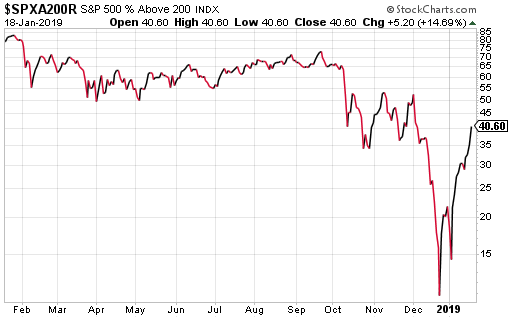 Ignoring the sentiment survey and focusing on the A/D line on the S&P puts everything into perspective. 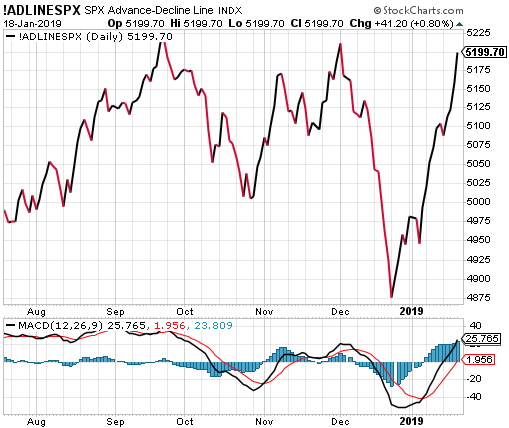 The A/D has gone almost vertical and almost to a new high. On Thursday the A/D line on the S&P was 6:1 in favor of advancers. That rose to 10:1 on Friday with 452 advancers to only 43 decliners. These are very bullish ratios, but it also shows just how overbought we are becoming. 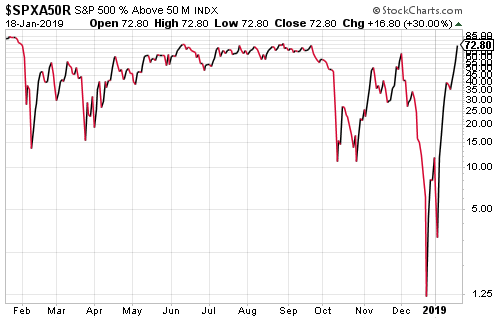 Another remarkable chart is the percentage of S&P stocks over their 50-day average. This percentage has rocketed from only 1.25% at Christmas to 72.8% on Friday. This is a very dramatic representation of the recent gains. The 200-day comparison chart is not nearly as dramatic but the longer-term average had not had time to decline as much as the 50-day. Only 48% of the S&P stocks have current buy signals. This could be a rebuttal to the overbought claim above. However, this is based on point and figure charts which typically have a longer reaction time to a normal chart. It takes longer for stocks to trigger a buy signal, but they also stay in that signal for a longer period. The Nasdaq remains the lagging index still a couple hundred points below the 10% correction level. However, the chip sector is recovering and helping to lift the Nasdaq higher. 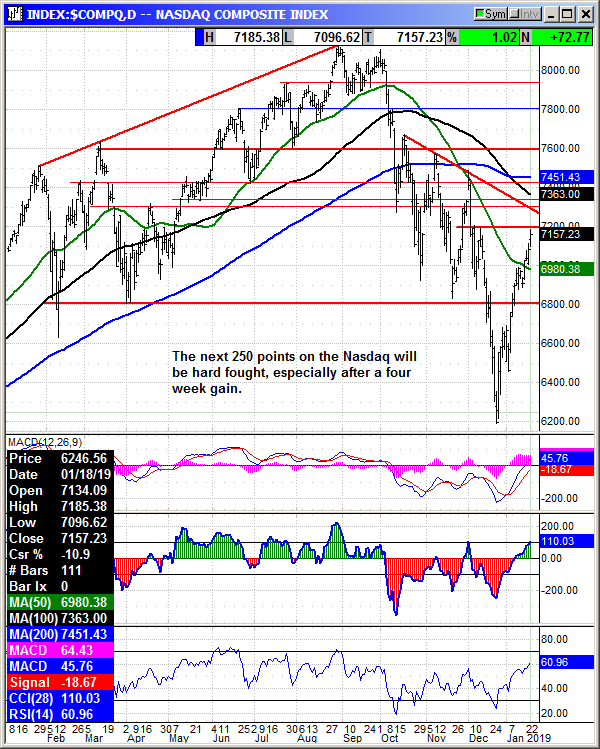 While chips were down early in the week, they rallied on the China news and that could be a lasting rebound if the tariff news remains positive. The FANG chart has turned positive. 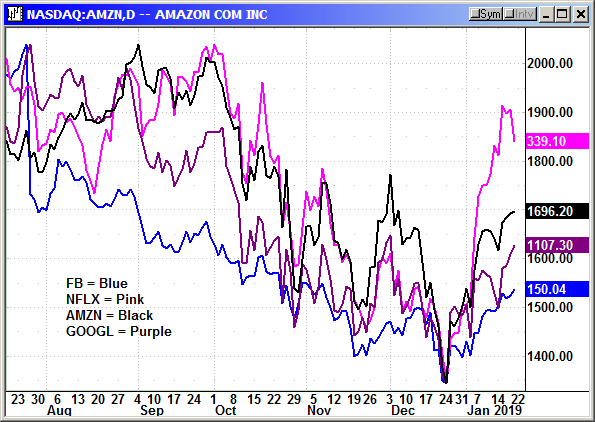 FB, AMZN and GOOGL were chasing Netflix higher but the leader tripped on Friday. I do not expect Netflix to decline significantly but any decline is a blow to FANG sentiment and to the Nasdaq index. I think anyone looking at the chart below would agree that Netflix is probably not going to be surging higher over the next couple of weeks. 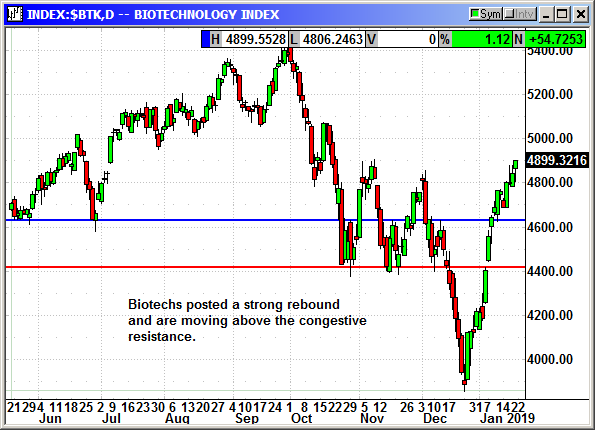 The biotech sector is also providing lift to the Nasdaq. 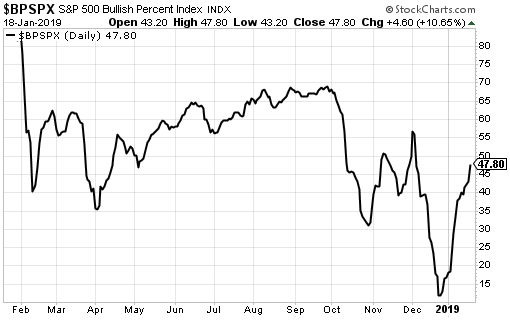 The index has moved through a period of congestive resistance and is breaking out to a three-month high. This has a good chance of continuing because Q1 is normally strong for biotechs. 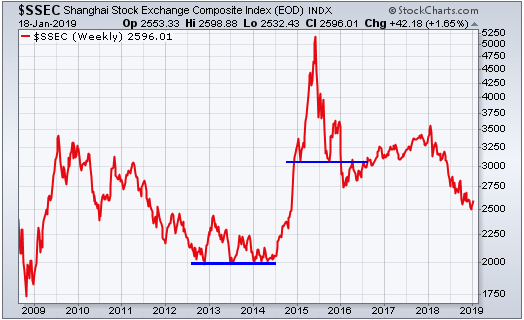 The Shanghai Composite Index has been in a sharp decline for all of 2018. 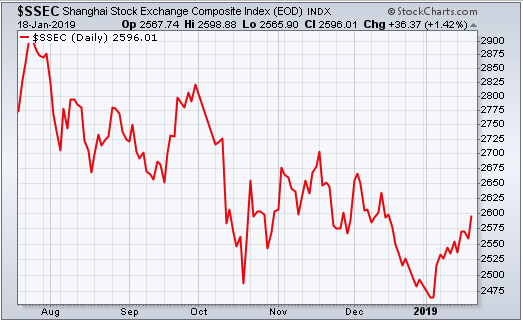 However, since Christmas the index has been accelerating higher. This is due to increased stimulus from the Chinese government, lowered loan regulations and optimism that a trade deal will be completed. The positive index is a sentiment indicator for the rest of Asia. If the index is rising the rest of Asia breathes easier. 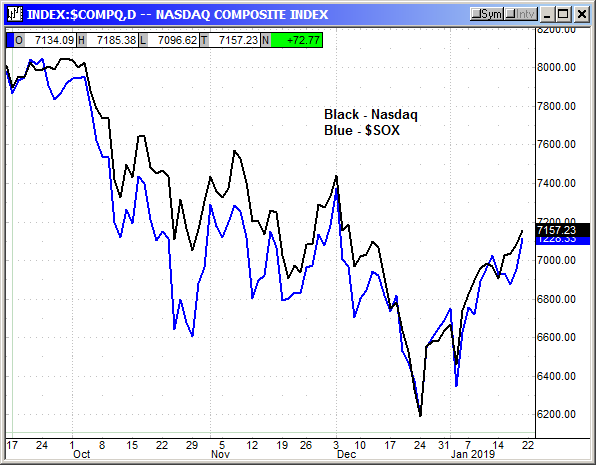 The Nasdaq has some serious congestive resistance in its immediate future. Moving between 7300 to 7500 could be a serious challenge and therefore the overbought market could choose to rest here we as wait for an outcome to the Chinese trade meeting in two weeks. I remain positive on the market and suggest continuing to buy the dips. We could see continued gains for the next two weeks then the outlook turns negative after the major tech companies report. We will be moving into the post earnings depression period about the time the volatility increases surrounding the Chinese negotiations.